When you have a campus of over 12,000 students, increasing student engagement can be a very challenging goal. With so many moving parts, solving a university-wide complexity issue requires innovation. Having adopted the OOHLALA Mobile Platform, Youngstown State is not only able to develop personalized student engagement programs, but is also able to measure their success. Now that students are able to book supplementary instruction sessions via their smartphones, Youngstown State is able to track which students are attending which sessions, as well as get immediate feedback, all through their mobile device. With over 6,000 student feedback responses, Youngstown State is able to see which services are performing well, and utilize the data to further improve the areas where students are under-served. On top of the 14,023 wall posts, YSU's campus app also recorded over 82,000 chat messages, over 51,000 "likes", as well as almost 33,000 comments. 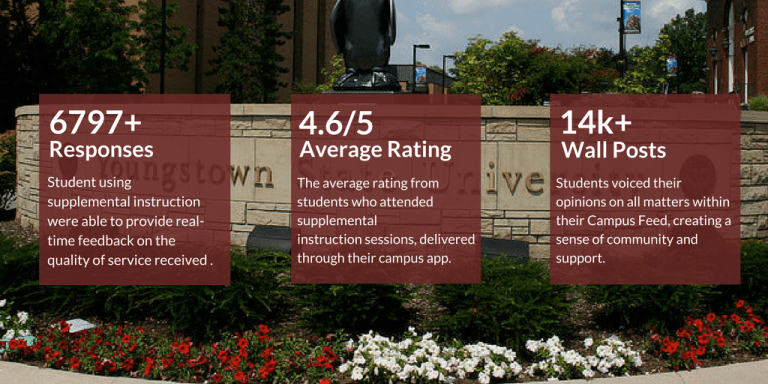 Based on these records alone, it is easy to see how much the campus app facilitates a sense of community and support by simply giving the students a medium to connect with the YSU network. "Today I learned not to panic and let my anxiety take control of me in certain situations. I was informed that I would not have to worry about my financial aid being affected because I was withdrawing from a communications course. Tara is definitely a great help and keeps me motivated on this journey." "Today I learned that I am a visual learner. We also talked about different methods of learning and studying that work best for visual learners." "My session was very informative. We went over different learning methods, memory aids, and the types of memory; we went over how we process information, and how that can help in my classes.